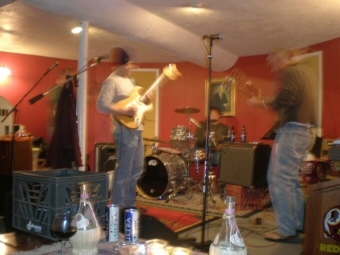 The Occasional Banister are a Baltimore, Maryland-based original music quartet. The sound is not unfamiliar, but defies neat categorization. Don't ask the band, unless "pensive boogie" or "granola funk" gets your ears perked. When collective influences run from The Beatles to Yes, with stops at Allan Holdsworth, Prefab Sprout, King Crimson and XTC, the trip can get interesting. Listen to the music for yourself. Bring a beverage. The team is as it has been since the band's inception two decades ago. Only the armamentarium has changed. Visit the musicians page for the whos and with-whats. Feeling good so far? Order "These Restaurants" online for $10 through our secure order form. We'll be glad you did. Oh yeah, the name. Like the music, there's no easy answer: Just the Occasional Banister.